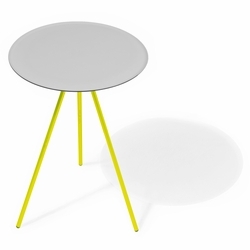 Helinox Table O. A log, a rock, your backpack, and even the book you brought have all been used as a table or cutting board when you're backpacking right? And it's not super awesome. The Table O weighs next to nothing but packs the huge benefit of not having dirt in your cheese or salami on your backpack. Makes a great plate in a pinch too. Comfort and convenience in the backcountry can be pretty awesome...and super light!